EventGhost is an advanced, easy to use and extensible automation tool for MS Windows. It can use different input devices like infrared or wireless remote controls to trigger macros, that on their part control a computer and its attached hardware. So it can be used to control a Media-PC with a normal consumer remote. But its possible uses go much beyond this. NOTE: The real plugin author is Pako. I've just copied this plugin from the forum to add-on's section of the site. GNU General Public License version 3.0 (GPLv3). This plugin consists of two components. 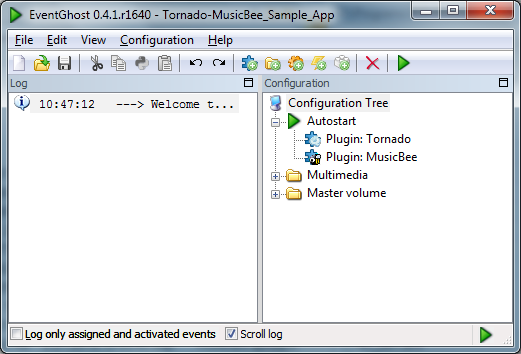 The first part - mb_EgPlugin.dll file - is installed into the subdirectory \Plugins of MusicBee program folder. 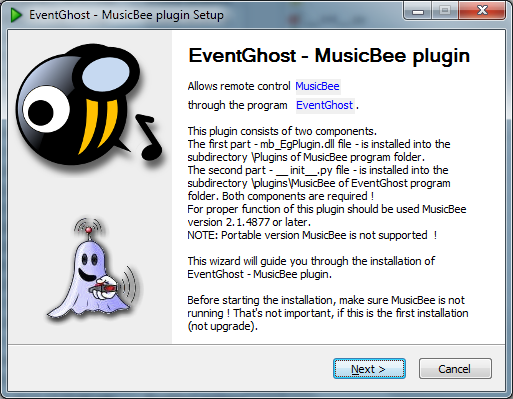 The second part - init.py file - is installed into the subdirectory \plugins\MusicBee of EventGhost program folder. Both components are required! To configure plugin go to 'Edit/Preferences/Plugins'. Go to 'Edit/Preferences/Plugins'. Click 'Uninstall'. Plugin will delete all automatically created files (e.g. settings), but you need to exit MusicBee and manually delete the file mb_EgPlugin.dll. MS VS 2010 project (C#) and Python. Most people don't need this.